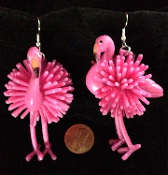 HUGE Funky Dangle Toy Charm PINK FLAMINGO EARRINGS Tropical Bird Luau Beach Party Costume Jewelry - Really Big Bright Pink Prickly Flamingos will definitely get you noticed on a cruise, the beach, a Luau, Summer backyard party, anywhere you want to be seen having fun. Great quirky party favors, too! Large funny rubbery toy, soft plastic, Florida tropical bird charms, each approx. 2-5/8-inch (6.56cm) long x 1-3/8-inch (3.44cm) wide. Cute kawaii kitsch to wear with your Hawaiian grass hula skirt and coconut bra, while sipping a margarita... Fun, Fun, Fun… in the Sun, Sun, Sun!! !